Army College of Nursing (CAN), Jalandhar Cantt. has recently given a notification of 03 Tutor/ Clinical Instructor Vacancies. You can apply for the Army College of Nursing Jalandhar Cantt. Recruitment 2018 on or before 22 December 2018. ACN Jalandhar Cantt. Recruitment 2018-19 notification is out. As per the Notification, there are 03 Tutor/ Clinical Instructor Vacancies. The educational qualification is M.Sc. (Nursing) in Mental or B.Sc. (Nursing). The age limit is as per the ACN Jalandhar norms. If you are looking for the Jobs in Jalandhar Cantt. Army College of Nursing then this article is going to be very helpful for you. Last Date: 22 December 2018. Educational Qualification: M.Sc. (Nursing) or B.Sc. (Nursing)/ Post-basic B.Sc. (Nursing) with at least 01-years of experience. Age Limit: The age limit is as per the college norms. Location of Job: Jalandhar Cantt., Punjab. Salary: As per the AWES rules and regulations/Negotiable. How to Apply: You can submit your application form along with the attested copies of testimonials/certificate to Army College of Nursing, Deep Nagar, Jalandhar Cantt.-144005 on or before 22.12.2018. 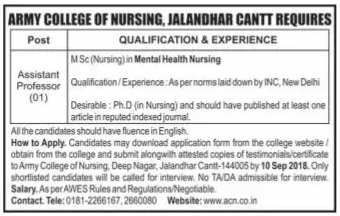 Army College of Nursing (CAN), Jalandhar Cantt. has recently given a notification of 01 Assistant Professor Vacancy. You can apply for the Army College of Nursing Jalandhar Cantt. Recruitment 2018 on or before 10 September 2018. ACN Jalandhar Cantt. Recruitment 2018-19 notification is out. As per the Notification, there is 01 Assistant Professor Vacancy. The educational qualification is M.Sc. (Nursing) in Mental Health Nursing. The age limit is as per the Army College or Nursing Jalandhar norms. If you are looking for the Teaching Jobs in Jalandhar Cantt. Army College of Nursing then this article is going to be very helpful for you. Last Date: 10 September 2018. Educational Qualification: The qualification is the M.Sc. (Nursing) in the Mental Health Nursing. The qualification and experience are as per the INC, New Delhi norms. How to Apply: You can submit your application form along with the attested copies of testimonials/certificate to Army College of Nursing, Deep Nagar, Jalandhar Cantt.-144005 on or before 10.09.2018. Army College Of Nursing, Jalandhar Cantt. has given a notification of various Assistant /Associate professor Teaching Vacancies on the ad-hoc basis. 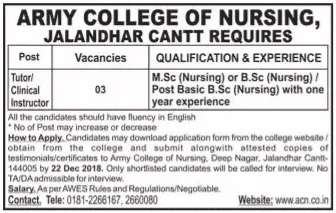 The interested candidates can apply for Army College Of Nursing Jalandhar Recruitment 2018 on or before 30 April 2018. Army College Of Nursing Jalandhar Cantt. Recruitment 2018-19 notification is out. As per the Notification, there are various Assistant /Associate professor, Tutor/Clinical Instructor Vacancies. The educational qualification for Army College Of Nursing Punjab Vacancy is Graduation and Post graduation. If you are looking for Teaching Jobs in Jalandhar Cantt. then this article is very helpful for you. Age Limit: As per department rules. How to Apply: You can send your applications to the Army College of Nursing, Deep Nagar Jalandhar Cantt-144005 along with the attested copies of testimonials/certificates on or before 30.04.2018. Last Date: 30 April 2018.